As all our rv furniture the Monterey II motorhome sofa are available in Ultimate Leather that is as soft as calfskin, yet it cleans easily with mild soap and water. Our line of Ultimate Leather RV seats are better-than-leather, easy-care polyurethane combines the beauty of fine home style furniture with solid automotive engineering. One of the the best offerings in a fine line of sofa beds. All rv furniture is also available in cloth. All of our Custom Built RV Furniture is made to order and your requirements. Converts to a "Flat bed" like all of our RV Sofas. "Wall Hugger" design allows sofa to be installed 1.5" from wall. Our RV furniture utilizes a high density foam package for better comfort and long-term foam retention. New design rv furniture sew package. Removable arms for easy entry in smaller rv doors. Standard widths 68",72",74" and 78". Custom widths available. All materials meet or exceed FMVSS #302 safety standards for rv seats . Three year manufacturers limited warranty on RV furniture frame construction. 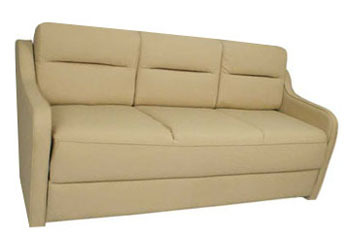 sofa bed, rv sofa beds, rv home style furniture, rv custom seats, leather rv seats , rv sofas, discount rv furniture. With our discount pricing on rv furniture you will not need to be satisfied with used or surplus rv furniture.